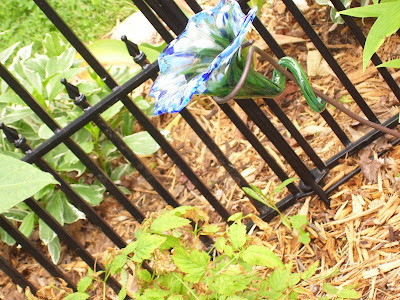 Yesterday, I went to the Outagamie County Master Gardeners Garden Walk. I took over seventy pictures of everything that caught my eye. Garden Walks are brain candy for gardeners, arm-chair and dirt gardeners alike. 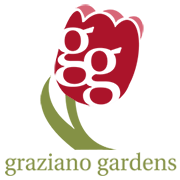 So I'm sure my next few posts will include lots of pictures, ideas, and thoughts on these gardens. I will say, I've given small tours of my yard, but I have never groomed it to a level of a garden walk garden. 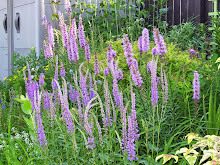 Never at any given time have I had all my beds weed-free, edged, deadheaded, and mulched within an inch of their lives. Today, my small amount of lawn needs a serious trim. It it raining again this morning and I have social get-togethers the rest of the day. Lawn mowing is not going to happen, not with an electric lawn mower. The first garden I will profile was by and far my favorite. 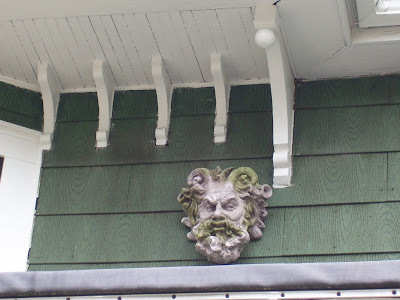 This was a house where the gardeners certainly knew a thing or two about gardening. It was the garden on a small lot that hosted a grand old Victorian house built in a wonderful style. It was easily three stories and featured, probably a first level parlour with a bump out of five or six rectangular windows that I imagine encased a window seat. As we were leaving my son looked up and saw tomatoes growing in pails on a deck (that was little more than flat roof) on the second floor. 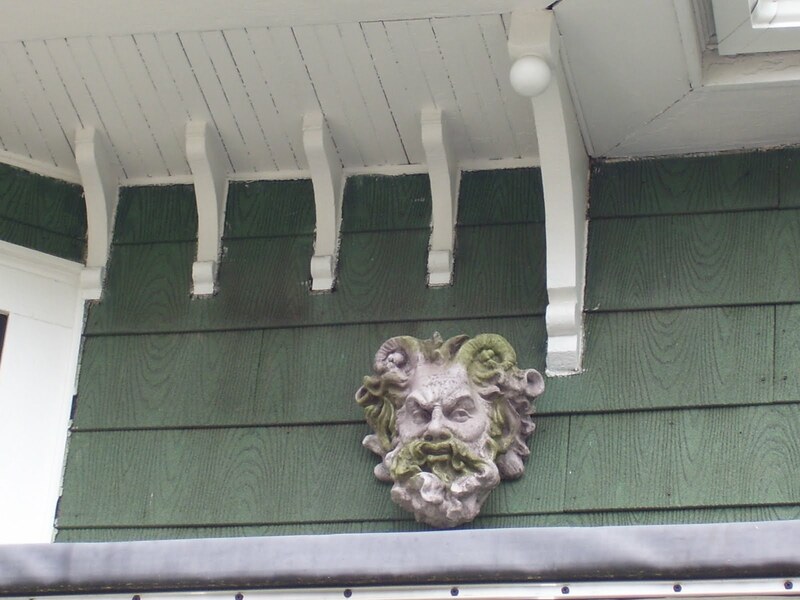 Similar to my house in Elgin, where I hung a stone woman within a huge, heavy grapevine wreath as an guardian spirit, this house had a green man hung under the eaves as its portal spirit. 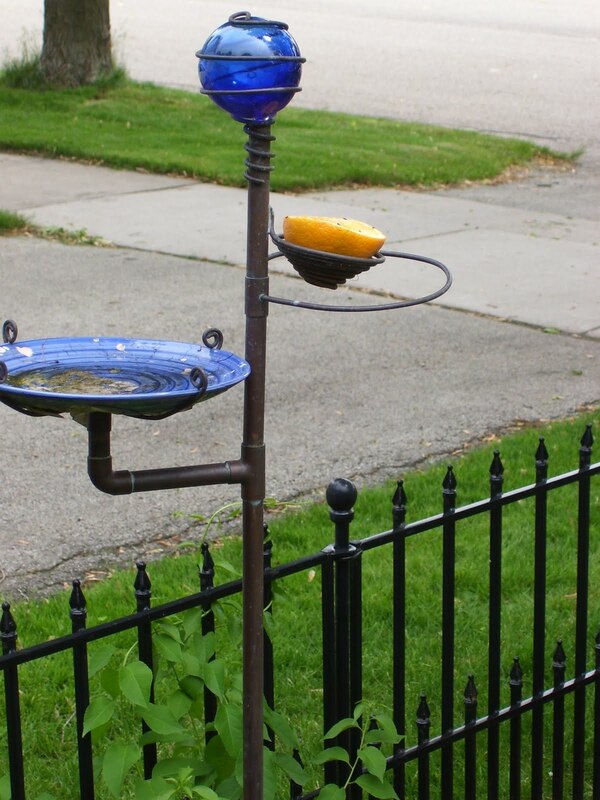 A lot of the bird feeding art featured copper plumbing pipe and blue glass. 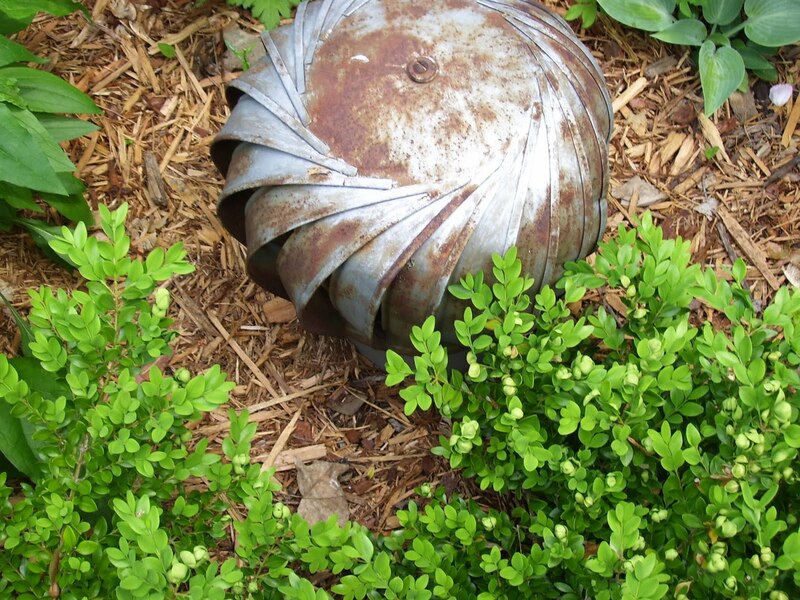 I've always thought these old exhaust vents would make great garden art! These last pictures show their night lighting, and pay homage to early rural electrification, and were funky beyond what I've seen. I don't think my pictures capture their cleverness. 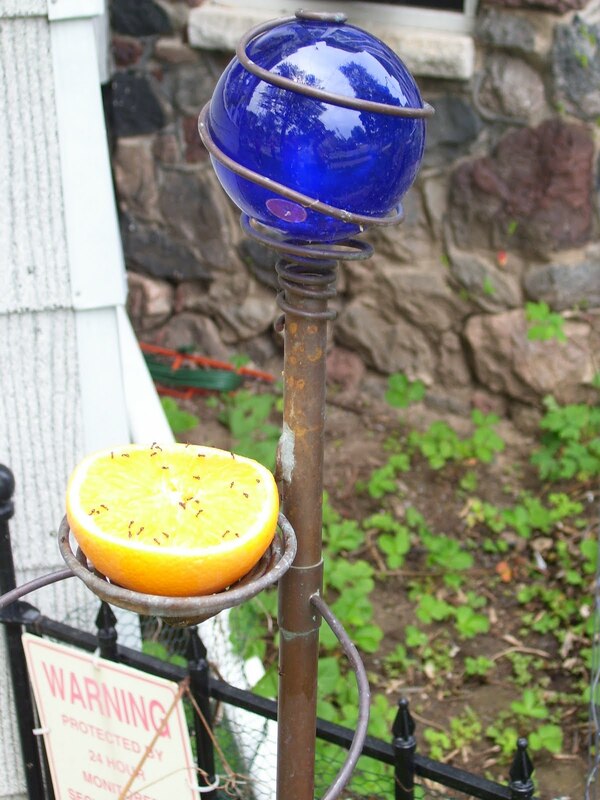 For that, I would probably need to photograph them at night when they are lit after I had added a bottle to their bottle tree. Love the blue glass sculpture! 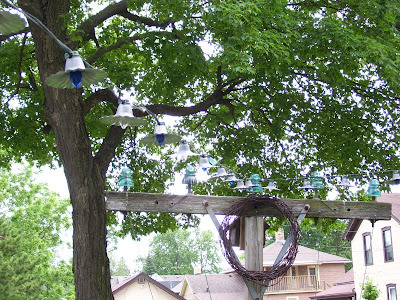 I love the blue bottle tree! I have about half of the blue bottles I need to make a tree! 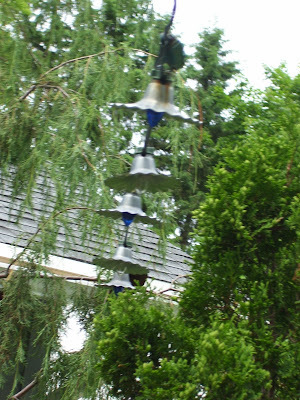 I love the blue bottle tree too. I will write a blog about bottle trees on the Dutch website www.tuinieren.nl. Hope it will be okay if I use one of your pictures with it. I will link back ofcourse! Yes, go ahead Clarissa. 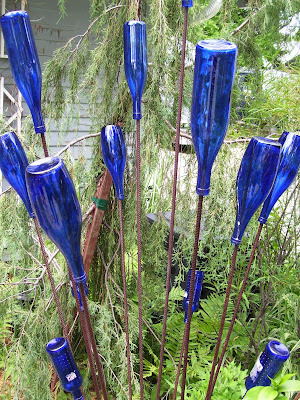 Bottle trees have been extremely popular here these last couple years. 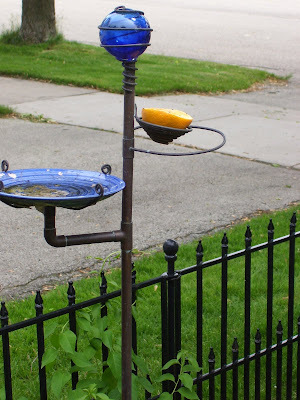 It is a possible DIY project and adds a lot of color to the garden, too. Where can I find the blue bottles for the bottle tree? Or red ones would look better in my garden. Do you know where I can find red ones? Collecting colored ones is difficult. World Market sells some bottled water in nice colored bottles. If you have an upscale restaurant nearby, they may work with you. Red will be very hard. Beautiful !!!! It gives a conrast color The stick of tre trunk is iron? Like the construction one? Thanks! 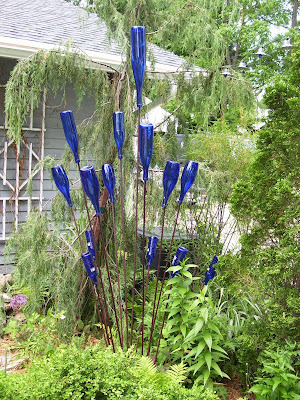 Yes, the bottle tree sticks are rusty iron rebar used in concrete work. Thank you for sharing the bottle tree, I have been wanting to make one and although I can weld I really did not want to get into that....but I love the rebar just stuck in the ground in that way. Now....off to the store!